The InflammaCORE drink mix provides wholesome macronutrition and the proper base of nutrients to help maintain a normal inflammatory response. Inflammation is a natural part of the body’s immune response, a cascade triggered to protect the body and maintain normal tissue repair. Because inflammation plays a role in so many health challenges, it is essential to support and maintain a healthy cycle of inflammation to achieve optimal health. InflammaCORE is an advanced nutritional formula built to address immune challenges, maintain a healthy inflammatory response and strengthen gastrointestinal (GI) barrier function. It represents an innovative, multidimensional approach providing powerful phytonutrients to support proper inflammatory control and a unique base of nutrients that promote overall GI health. InflammaCORE is an all-natural, fructose-free formula featuring 19 g of easy-to-digest organic brown rice protein and 4 g of flax-based fiber per serving. In addition, InflammaCORE provides high amounts of L-glutamine and glycine, amino acids crucial for intestinal reinforcement and mucosal cell regeneration. 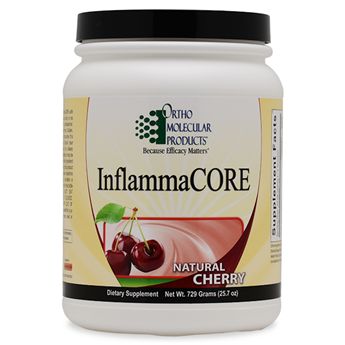 InflammaCORE is available in natural cherry, banana creme and orange splash flavors.